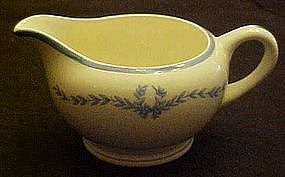 A nice creamer in the blue laurel garland pattern by WS George. Also marked on the bottom is Derwood, which may be the shape or tye of eggshell china used. Measures 2 5/8" tall. Perfect condition with NO cracks or chips.